The Wednesday evening is cool and clear as I walk toward my favorite shop in the world. I make my way up the stairs, pausing as usual to admire some of the framed craftsmen photographs, excited to add a new skill to my bag. I’m on my way to take a Highland Woodworking workshop, the first I’ve ever attended. It will prove to be an informative evening of expert instruction, hands-on practice, one-on-one feedback, and very sharp tools. I enter the workshop, a part of the store most customers never see, and am pleased to find workbenches, toolboxes, lathes and whetstones all ready for use. A short older man in glasses and work smock was busy laying out the items of the evening: turning tools, waivers, sharpening stones, and grinding gear. This is Hal Simmons, our instructor. Hal’s been turning for 19 years and has studied with many accomplished artists of the trade. As a member of the Georgia Association of Woodturners and a veteran HWW instructor, he’s an enthusiast through and through. Always make sure your grinding wheel has a flat, clean surface before sharpening. Keep both hands on the tool at all times. 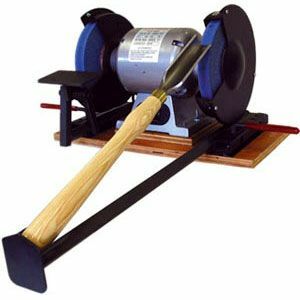 Heat is the biggest enemy when sharpening: using a coarse-grit wheel (60 grit) makes quick work of removing metal, reducing your risk of overheating. Use the ink of a marker on the surface that you’re grinding to ensure you’re taking metal away where you want to. Don’t worry if there is a slight bur on your edge, this will be removed when the blade meets spinning wood. We’re then put to the test, practicing on the provided tools. There is, of course, a lathe on hand, and we test our new edges immediately. Hal points out minor variations in cuts and angles that indicate the veracity of the grind. No one moves on until they have achieved the proper edge. We spend the evening working our way through the remaining blade styles, each participant becoming more and more confident in his form and technique. It is encouraging to see these men, some of whom had been turning for years and never sharpened their tools, finally gain this confidence and understanding. What had begun as a few shy questions quickly turns into a no-holds-barred barrage of specific questions met with abundant feedback. How pleasing to be part of an excited bunch of wood workers nerding-out about tools with the expert! Hal keeps us going with patient efficiency right up until 8:30, concluding with a short recap. He sends us off with his contact information, encouraging further correspondence and safe turning. I leave with a vastly enhanced understanding of lathe work in general and the confidence to take care of my future tools. I look forward to taking more classes here; what a valuable resource for the in-town woodworker! excellent course provided by Hal. Learned a lot about sharpening my tools which will no doubt enhance woodturning skills!! Highly recommend!